Bypass the ticket/voucher queues at the entrance and head straight to the elevator queue! Open daily from 8 a.m. to 2 a.m., along with a gift shop filled with exclusive items, there are eight in-building dining options including the contemporary cuisine of STATE Grill and Bar and Tacombi, an authentic taqueria. You will be sent an open-dated Empire State Building Observatory Ticket which can be redeemed at any time during your stay in New York, giving you the flexibility to plan around the weather and visit at any time of your choosing. Your Empire State Building Observatory Ticket will enable you to move directly past the ticketing and voucher redemption queue at the entrance. However, you will still need to join the line for the elevator and mandatory security check. The elevator line can be long at peak times (normally 11.00am to 1.00pm, and one hour before and after sunset). If you wish to avoid the crowds, we recommend you visit outside these times. 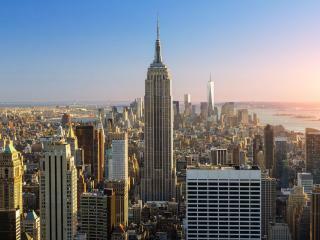 Departs: The Empire State Building Observatory is open daily, year round. Start Times: 8.00am to 2.00am. Last elevator to the top goes at 1.15am. Your Empire State Building Observatory Ticket will enable you to move directly past the ticketing and voucher redemption queue. However, you will still need to join the line for the elevator and mandatory security check.